Bleeding Gold is dropping Thunderegg‘s full-length vinyl debut, Cosmos, recorded by Alan Weatherhead (Sparklehorse, Magnolia Electric Co.) in Oakland and featuring the Bay Area lineup (Alex Jimenez, bass; Reese Douglas, guitar; André Custodio, drums). Packaged in a deluxe gatefold and exploding with guitars, Cosmos is the Egg’s deepest plunge yet into space, blending the usual clever lyrics, sweet melodies, and ragged rocking with a layered roar that begs to be blasted. With the gloomy psychedelia of The Growlers, the spaced out vocals of Jesus & Mary Chain and the expansive instrumentation of Brian Jonestown Massacre, Dream Joints weave together a patchwork of influences to create a unique sound that stretches from vampiric to blissful. All the while sounding immediate and absolutely vital. Tape Waves is Kim and Jarod Weldin, a dream pop duo from Charleston, South Carolina. With shimmery guitars and hushed vocals that repeatedly charm the blogosphere, their songs evoke images of hazy summer days and young love. Their sun-drenched pop songs have garnered attention from numerous media outlets including NYLON, BlackBook and Impose. Their sophomore LP titled ‘Here To Fade’ is released with Bleeding Gold Records on July 29th, 2016. The 10-song album is available as a limited edition colored gatefold vinyl 12″(blue/white swirl and grey), as well as CD and digital format. Tape Waves are dreampop duo, Jared and Kim Weldin from Charleston, SC. The band are set to release their sophomore album ‘Here To Fade’ on 29th July 2016 and the first track from the album is ‘So Fast‘. For a track which instrumentation is almost quite folky in nature regarding the guitar and basslines, this dreampop track is not typical of its counterparts. This is only a good thing and makes ‘So Fast’ a rather unique track. The soft vocals throughout are contrasting to the instrumentation, drowned in reverb in which the colourful guitar melodies stand out against. The track ‘So Fast’ will be available on Tape Waves next album ‘Here To Fade’ which will be released at the end of this month, but for now, you can listen to it via Soundcloud below. The long-awaited debut full-length album from Manchester’s SONGS FOR WALTER has been teased throughout the last few years with free download singles and tales of bygone Hulme-family history. Singer-songwriter Laurie Hulme is ready to lay out the full story with this 13-track CLEAR VINYL 12″ LP in gorgeous gatefold cover with printed lyrics. Officially released January 22nd, 2016 but if you order in the US from this link you can make sure your vinyl arrives no later than release date if not MUCH sooner! CDs coming soon. Order in the UK here. Full-color cover and lyric insert. Includes digital download card. ORDER 12″ HERE. LISTEN HERE. New 45rpm 12″ EP from LES BICYCLETTES BLANCHES. More info here. Black and white professional covers and full-color lyric insert. ORDER 12″ HERE. LISTEN HERE. BUY IN UK/EURO HERE. Chosen Era, the debut Lame Drivers 12″ LP, is out Oct 9th in collaboration with Bleeding Gold Records (LP) and Jigsaw Records (CD). Chosen Era was recorded by Lame Drivers at home in the basement, and also by Matt Tong (ex-Bloc Party), and Travis Harrison (Homosexuals, GBV), and Geoff Sanoff (Obits) recorded one of the bonus tracks. All mastered by Jamal Ruhe (Sheer Mag). 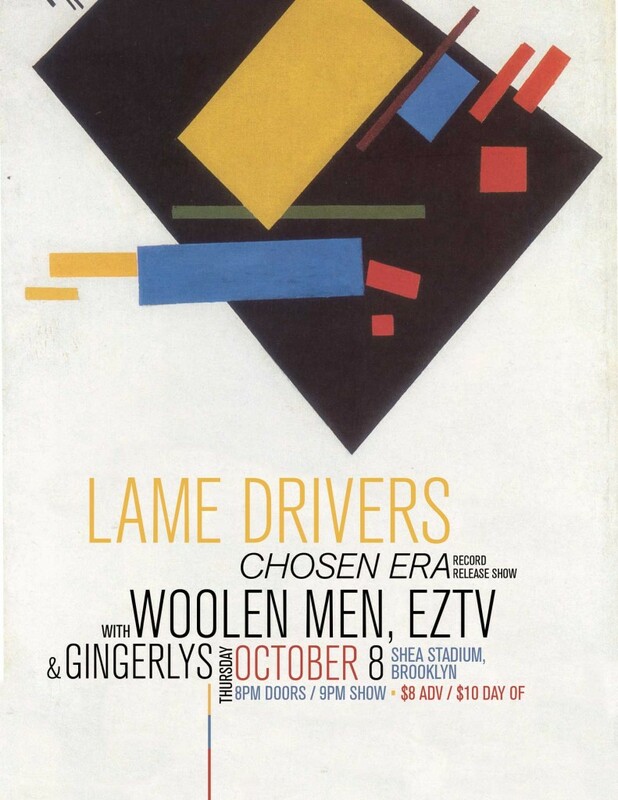 Release show Oct 8th at Shea Stadium with The Woolen Men (Woodsist / PDX), EZTV (Captured Tracks) and Gingerlys (Shelflife).